We can probably plot Shaw Brothers’ descent into madness from around this period. This was the studio’s response to the kung fu horror trend, released in the same year as Sammo Hung‘s seminal shock phooey screamer Encounters of the Spooky Kind. The story centres on a rivalry between two masters which takes a macabre turn in the lead up to a lantern festival. The rich Master Lung (a wonderfully unhinged Lau Wing) – so eager to better the exploits of his nemesis Master Tan (Chen Kuan-tai) – enlists the unholy exploits of a sadistic craftsman to help prepare the ultimate exhibition. 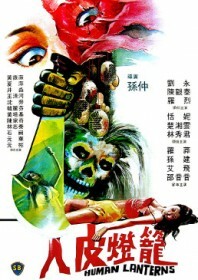 Chen (Lo Lieh, relishing every maniacal minute) takes an unorthodox approach to his work; donning a skeletal yeti disguise to kidnap the master’s closest female relations, before skinning them alive in his mangled Hammer Horror workshop to use as grisly adornments in his luminous masterpiece. To discard this insane Shaw decapitator as simply cult and kitsch would be unfair. It is cult and kitsch, obviously, but Shaw’s high production values and house style are faultlessly retained with particularly exquisite set design, class performances, and a director who manages to conjure great suspense from a particularly limited special effects department – like somehow making a man on a wire in fluffy Ugg boots look quite scary. Completely tapped, but quite brilliant.